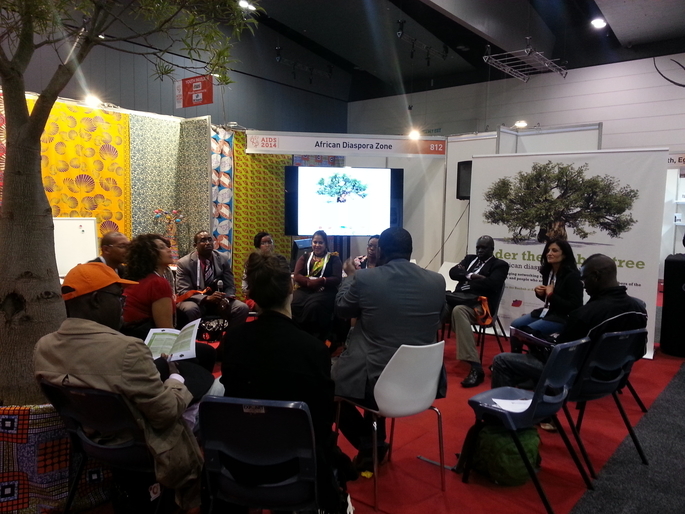 In July 2014, the Multicultural Health and Support Service (MHSS) hosted the African Diaspora Networking Zone at the International AIDS Conference (AIDS 2014) in Melbourne, in partnership with the African and Black Diaspora Global Network on HIV/AIDS (ABDGN) and the Australian Federation of AIDS Organisations (AFAO). The zone, with the theme “Under the Baobab Tree” was decorated with African wax print fabrics and featured a living Baobab tree, warmly inviting passers-by to come and learn about the distinct issues relating to visibility, access and inclusion faced by African and Black Diaspora communities. The zone included formal presentations and workshops, cultural performances and provided a comfortable space for networking and informal discussions. This was the first international partnership for MHSS and was considered an overwhelming success both by partners and visitors. Read a Summary of the African Diaspora Networking Zone Report or the Full African Diaspora Networking Zone Report.